Brave Warriors qualified for Afcon despite hammed 4-1 by Zambia in their final qualifying match. The Brave Warriors qualified for Afcon on Saturday's final qualifying match against Chipolopolo at the National Heroes Stadium in Lusaka, despite being hammered 4-1 by Zambia in their final qualifying match. Namibia coach Ricardo Mannetti says they will be no pushovers at the Africa Cup of Nations (Afcon) finals even though they are not a household name in African football. Namibia finished as Group K runners-up after being thrashed 4-1 by Zambia in their final qualifying match in Lusaka at the weekend. With their only two previous appearances at Afcon finals ending at the group stages, Mannetti is already refusing to let his side be bullied at Egypt 2019 in June. Mozambique was third on seven points, and Zambia was at bottom of the Group K log standings with only four points. This meant that Zambia, who were up for their last encounter against the Brave Warriors on Saturday, had no chance to qualify. Mozambique needed to beat their hosts in Guinea Bissau on Saturday, which would put them on 10 points, past Namibia and Guinea Bissau, who would have remained stuck on eight points. For Namibia, a draw (one point) in Lusaka was an assurance for a ticket to the African Nations Cup Finals in Egypt no matter the outcome in Guinea Bissau. In the final stage of the two matches, Mozambique seemed to qualify as they led 2-1 against Guinea Bissau. Namibia, who trailed Zambia 0-3 at that time, looked poised for disaster. 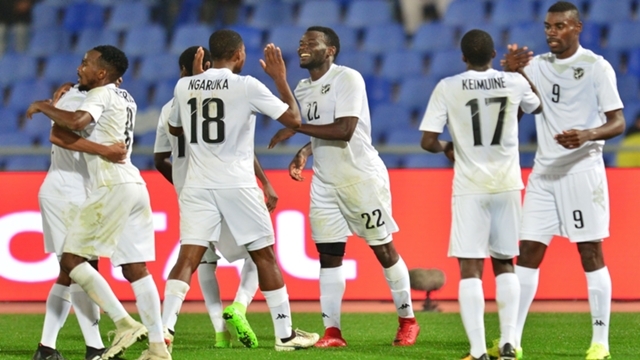 If the two matches had ended that way – the Brave Warriors were going to kiss their participation in this year's Afcon goodbye, but as fate had it, Guinea Bissau pulled a goal back in added time to cancel out that worst scenario for coach Ricardo Mannetti and his charges. The final results of the group matches meant Guinea Bissau finished top with nine points. Namibia and Mozambique were tied on second place with eight points each. However, according to Fifa rules, Namibia qualified because they were superior to Mozambique in the competition – having beaten Mozambique 2-1 during the first leg in Windhoek, and 1-0 with Peter Shalulile's lone strike in Maputo in the second leg. Thus, the Brave Warriors, who played Zambia in Saturday's match as if they were not interested in qualifying for the nations cup tournament in Egypt, have Guinea to thank for pulling them past the last hurdle.